Make your apprentice do all the work so you have time to woo random sims! The quest began just before 5 pm, but the blacksmith had a full day of job duties and errands to run. His first quest objective was to speak with the monarch about smithing duties, but it could wait a while. The smith went to the Village Shoppe to buy some bear meat (in case it’s needed for crafting) and some basic food supplies. Then he discovered and harvested several types of ore around the path to the village and the training yard. He returned home and repaired a pirate’s rowboat with the forge. He had some soup, then crafted some armour for a guard. It was getting late when he delivered the boat and armour to his customers, so the blacksmith went home to bed. In the morning, he woke before 6 am. He discovered more types of ore along the path to the castle, then talked to the king about smithing duties. The king said a large order would be coming and advised the smith to hire extra help. The next quest objective was to tell 3 people that he was looking for an apprentice. He collected more raw materials for crafting and spoke with villagers he met along the way. He spoke with the third villager, a female guildsman, and received a tip about a young man who would be a great apprentice. He put his quest on hold briefly in order to befriend and seduce the female guildsman. He took her home for some woohoo and the woman left immediately after, so the blacksmith cooked dinner for himself and ate alone. The next quest objectives were to buy an amateur’s apron from the Village Shoppe, forge some tongs, and forge a helper’s hammer. He went to the village to buy the apron before going to bed around 1 am. He slept and forged the tongs in the morning when he woke up. Then he mined some more raw materials from around the smithy and the path to the village. He took care of his daily job duties and was pleased to see his romantic interest hanging out in Town Square that afternoon. He serenaded her and charmed her into his bed once again before forging the hammer for his new apprentice. His next objective was to forge some training scraps for the apprentice to practice on, so he did that right away. He was summoned to the throne room to get an update from the king just as an applicant arrived at the smithy. It was a woman rather than a young man, as the blacksmith expected. He decided to hear the king’s update first, so he went to the castle. The king gave him his next objective, which was to craft some prototype armour. He had to take care of his dailies and gather more raw materials before going home. He forged some plate mail to sell in the village, then talked to the applicant to determine her suitability. The applicant offered to clean up, so the blacksmith needed to give her some time to do the job. In the meanwhile, he forged the prototype armour for the king, and delivered it personally. The king loved it and said he wanted a hundred pieces of the new armour! The blacksmith returned home to find the place filthy, and he needed to decide how to decline the lazy applicant. He fired her with extreme prejudice and his next objective was to kick her out of his shop, which he was glad to do without delay. The next quest objective was to interview the apprentice-to-be, the young man the blacksmith had heard good things about earlier. The interview was put off until morning because it was nearly midnight and the smith was exhausted. In the morning, he interviewed the applicant. First, he quizzed the young man about smithing, then asked if he was confident handling hot metal. He hired the applicant after the interview. The next quest objectives were to give the new apprentice his tools and materials, then forge the noble’s sword for the monarch. The smith needed decorative gems and a longsword to craft the noble’s sword, but the Village Shoppe didn’t have any decorative gems when he checked. He would have to wait for the shoppe to get fresh stock in the morning. He mined around town, then forged a new hammer for himself and crafted a longsword. When the store refreshed, the blacksmith was able to purchase decorative gems to finish the noble’s sword. He went home and forged it before his daily duties were posted. Next, the blacksmith needed to check the apprentice’s work, and he was surprised to learn that the guy had finished the entire order for the monarch already! The next quest objective was to deliver the equipment to the monarch, but the blacksmith took care of his dailies first. After making the delivery to the monarch, the quest ended in platinum, earning 1 security and 2 knowledge aspect points for the kingdom. 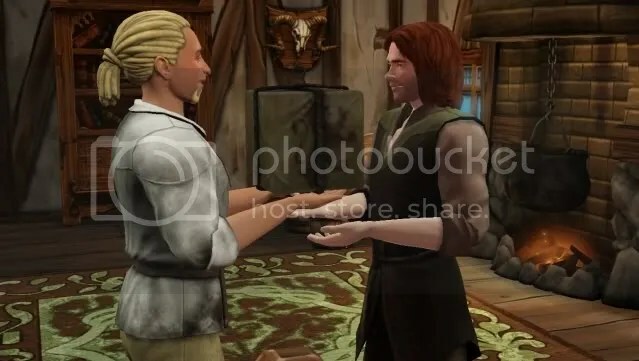 This entry was posted in Quest Walk-throughs and tagged Blacksmith, quest walk-through, The Blacksmith's Apprentice, the sims medieval. Bookmark the permalink.